The following, older nuvi models have been discontinued, though many are still available online and are fully supported by Garmin. Here is our current chart to compare Garmin nuvi models. The following, older nuvi models have been discontinued, though many are still available online. Speaks street names – Formally known as text-to-speech, this function allows the device to call out the name of the street for upcoming turns, so you’ll get “in one-half mile, turn left on Oak Street,” rather than just “in one-half mile, turn left.” The only current nuvi without this is the 1100 series. Live traffic – A nice feature that isn’t quite ready for prime time. Expect lots of inaccurate reports as well as incidents that aren’t reported. Delivered via FM, this service is provided by the Traffic Message Channel, hence you will sometimes see it referred to as FM-TMC. Here is a link to a coverage map. Most Garmin nuvis with a T following the model number have ad-supported traffic (see reviews for screenshots). One exception to all this is the 3490LMT, which features ad-free HD traffic. MSN Direct – UPDATE: MSN Direct services are being permanently discontinued as of January 1, 2012. Multi-point (multi-destination) routing – A very nice feature, but not a critical one. If the chart says “no,” you can only enter one destination and one via point. This isn’t problematic since you can easily find locations under Favorites or Recently Found. The one exception here is the nuvi 2×5 series, which allows multiple via points, even though it doesn’t have the other true multi-destination features such as sorting. Track display – See where you’ve been. This shows up as a thin blue line as shown below. It can be helpful in finding your way in unfamiliar areas. Found on all current nuvis, but only some discontinued models. Speed limit display – 100% of roads aren’t covered, but I typically find that most are. 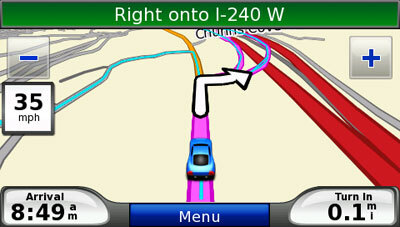 Lane assist – Shows which lane you need to be in for Interstate exits and some surface streets in larger metros. What’s the least expensive model with traffic and mulit point destination please? Prices vary but I would look at the nuvi 2455LMT or 2555LMT. Does your GPS device receives update in Nigeria?